Home › Facts › Is it me? … or is it a left-handed thing? We were asked by a Club member whether any of us also have problems with greeting people with a kiss, either on one or both cheeks. She said that she often ended up bumping noses or planting the kiss firmly (and embarrassingly) on the other persons lips because she always seemed to start on the wrong side. 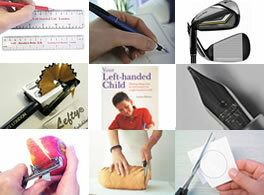 We thought about is and realised that we all do the same – it IS a left-handed thing! 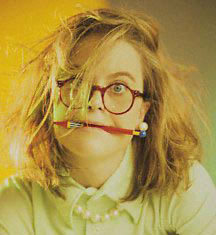 It seems that a lot of the quirks that we have are a result of being left-handed in a right-handed world. You can see a longer list of these and a huge amount of feedback from Club Members here. The quirk that started it all was social kissing, and you can read a selection of anecdotes about that on the kissing confusion page. 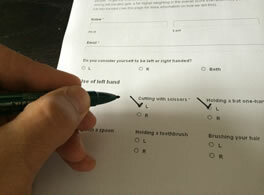 Click here to join the Left-Handers Club FREE if you want to keep up to date with our surveys and Club member responses – It ISN’T JUST YOU – a lot of left-handers seem to do the same things. If you want to add your own thoughts or experiences, please add a comment below. I always make my check marks the opposite way of all my right handed friends. I also notice that I put my greeting cards in backwards. Oh ,well righties will just have to deal with me. I’ve dealt with right handed stuff for 62 years. I always sit at dining areas with no one on my left side if I can. Just proves we’re special! Raise your hand, all left handers that install keyholes upside down so they can be easily opened with the key on the left hand. I am more and more frustrated when I wash up. I use my left hand to hold the sponge and my right to hold the object I am washing. I find that the norm to put the draining board on the left is very annoying. I want to rinse and put the dishes to drain on the right. I find that I either have to cross my right arm across my body to put the dishes on the draining board or have to put the sponge in the water before rinsing and placing. I would love to design a left handed kitchen. When I was little I could not tie my shoes till the 3rd grade. My parents tried to teach me but it never worked. At recess I had to ask my sister to tie my shoe. I always thought I was a late sprouter but now I know why I could never do many things. I had to witness some estate planning documents. In my 40 years of witnessing documents being signed I never saw a left-handed person do this. He turned the document upside down and signed his name upside down. When it was turned back to right side up it had his name signed correctly. He doesn’t write it backwards, just upside down. He said that is how he writes all the time. He just turns the page upside down and begins writing. Has any of the left-handers out there seen this? It was fascinating. He taught himself to do this. Not printed either, penmenship. Yes, you guessed it, the Heater Controls are on the right. Very hard to get at, & you can’t see what you are doing. Every time I go to light it, I Turn the Knob the wrong way & put the Pilot Light out. Start again. Another thought, why is that Australia & a few others, All Drive on the Left Side of the Road, but, most likely nothing to do with being Left Handed. In The USA, their Cars are all driven on the Left Side of the Car. Not sure about that one either. When I was a worker, sent to the Store for Materials, had to write in Triplicate, & when you got near the end of Requisition Forms, & being 400 Pages it was very difficult. I wood annoy the hell out of them, & turn the Form Book around, which made it easier for us Lefties to write in, but of course it was upside down for the Storeman, & he got really upset, & we wood tell him to get some L/H Req. Forms. Of course it never happened. When I was a child, loos were a nightmare, either in restaurants or highway toilets, or even at friends : I often just didn’t get the grip of it and had to cry for help.In the end my parents just told me not to lock myself up ; to my shame this is what I’m still doing though I’m a “mature” lady ! In airports I put my suitcase across the door, in planes I just tell the stewardess I won’t close the door if she could be kind enough to keep watch : they are used to such behaviour. Though they might be thinking : oh no another claustrophobic … they keep smiling. And the terrible expériences with being locked in those cubicles left me indeed .. claustrophobic. I hate being closed in anywhere and am very reluctant about lifts, planes, and the like. To me people working in submarines, or in the underground are real E.T’s. Never ever did I visit any cavern. I’d rather be sick for hours on a ferry than use the Eurotunnel. But the comforting thing is I still had, and hope I’ll still have for many more years, a wonderful life, as well on the family level as on the business level, and and these days more and more tools and devices are making a lefty’s life so much easier as when I was a child. I Wonder whether the “loo lock-in syndrome” has traumatized other lefties ? Hum ? Is that why i don’t lock bathroom doors? I usually stop at places that don’t have locks on the bathroom doors like McDonalds their doors don’t lock so I’ll go there if i need to go when I’m outm or hold itv until I’m near a place that has the right doors. Lol i hate elevators too n take the stairs. I remember getting locked in a bathroom when i was little and never knew why as i thought it was the door but now thinking maybe i just couldn’t unlock because I’m left handed ? and didn’t know how too! I never knew left handed people had problems with locking or unlocking doors! So maybe that was the problem and i didn’t know that! Wow! I don’t like tunnels or high places either. I just want to tell you that we all very special people. We think using more of our right brain. We solve problems faster. We see things in a wider prospective. We are more artistic. We get connected with the source better. We are really special. We are not common so we are not ordinary.